Elly the Reindeer is a cute cartoon-style reindeer. She has adventures with her animal friends in a sweet rural setting where all the child-like characters live in their own homes and look to each other for help, fun and solving the occasional dilemma. 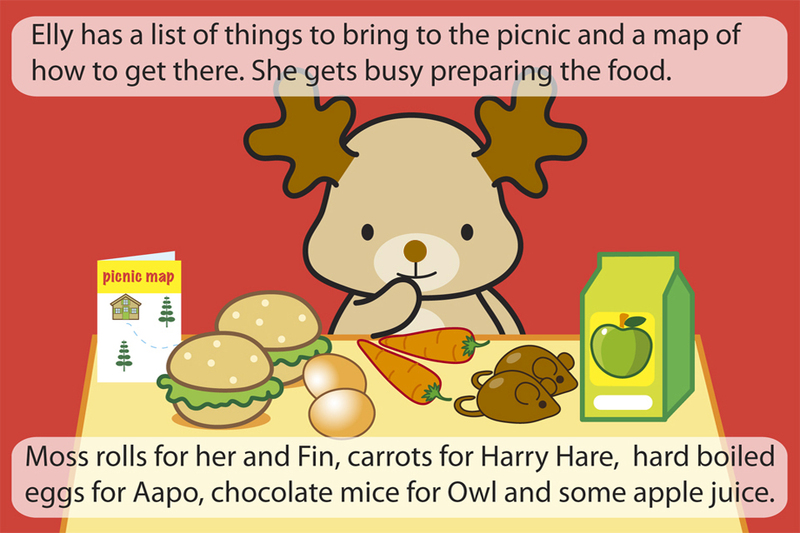 In this story Elly goes on a picnic, bringing lots of her friends favorite foods. She starts out with a map and plans to go on a long hike to the hill where she will meet her friends for lunch. Along the way she gets hungry and eats most of the picnic basket's contents (except for the chocolate mice she leaves with Owl). After she gets to the picnic spot, she finishes off the juice and falls fast asleep. When she wakes up, all her friends have arrived. Thankfully they brought along plenty of food. This cute series of books has become a fast favorite of my preschooler at bedtime. The books are not narrated and have no settings, but they are short & sweet. This makes them perfect bedtime stories. With features like simple swipe-style page turning and an easy to read font, they are also a good choice for children learning to read. In this ebook, the fourth of the Elly the Reindeer books, Elly goes on a picnic. First she prepares several of her friends favorite foods, like moss rolls, carrots, hard boiled eggs and chocolate mice for Owl. Then she heads out with her map. She stops to rest by a duck pond, sharing the moss rolls with the birds. Then she encounters Owl, who is so tired he scarcely notices when she leaves him the chocolate mice. When she arrives at the waterfall she is so hungry she finishes off the eggs. With quite a climb ahead of her, she also eats the carrot for good measure. Finally she makes it to the hilltop picnic spot, drinking down the juice. She then falls asleep until her friends awaken her. Startled, she realizes she has eaten all of the picnic items. Her friends laugh jovially, having brought more than enough food for everyone. Owl even marvels at the mysterious gift of chocolate mice that he found when he woke up.